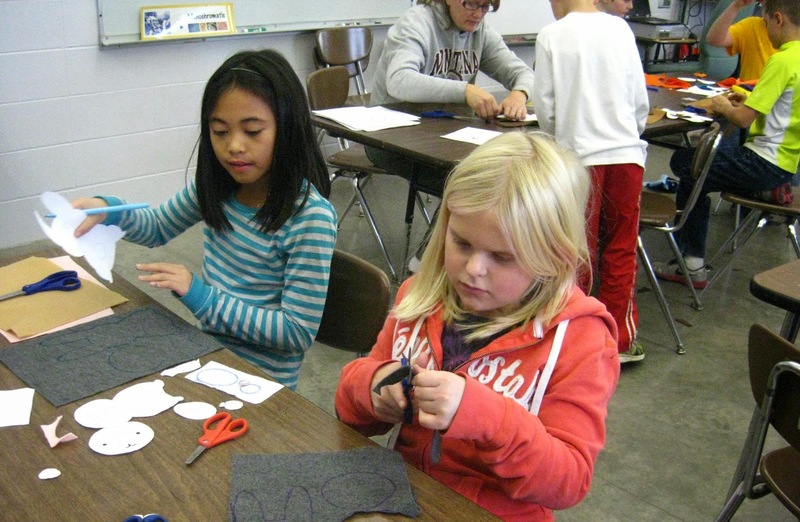 We started an Art Club last year, Spring 2014, with all age levels, Kindergarten through Grade 5 and created goggles of enhanced perception and huge painted murals on paper of earth environments at Ridgeway Community School. It was so popular that I had over 45 students enrolled. 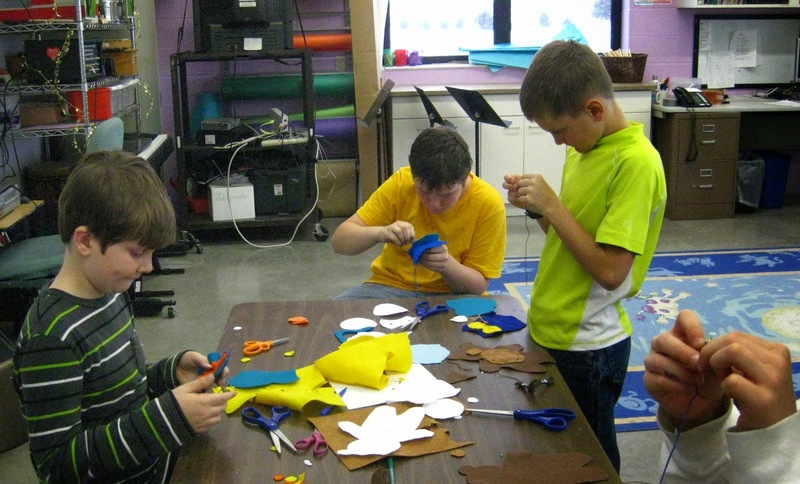 This year, I've created a smaller club incorporating different projects for each session. 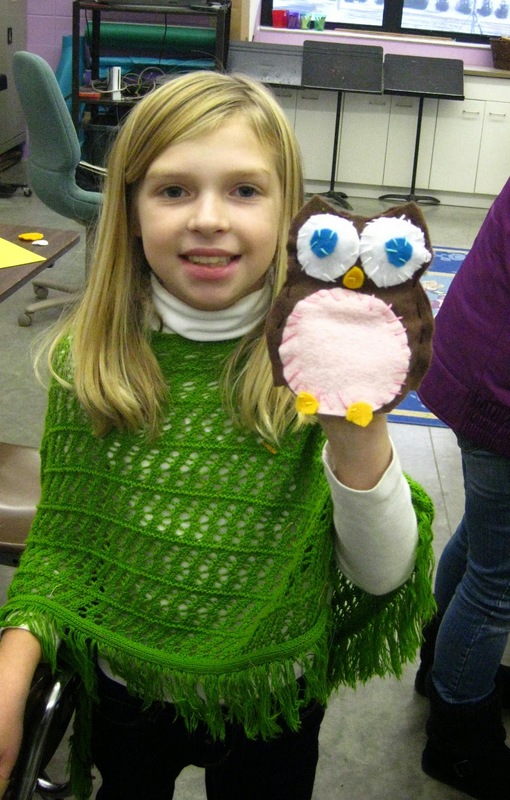 This fall, the 3rd - 5th Grade students stitched puppets with felt, embroidery floss, and buttons. 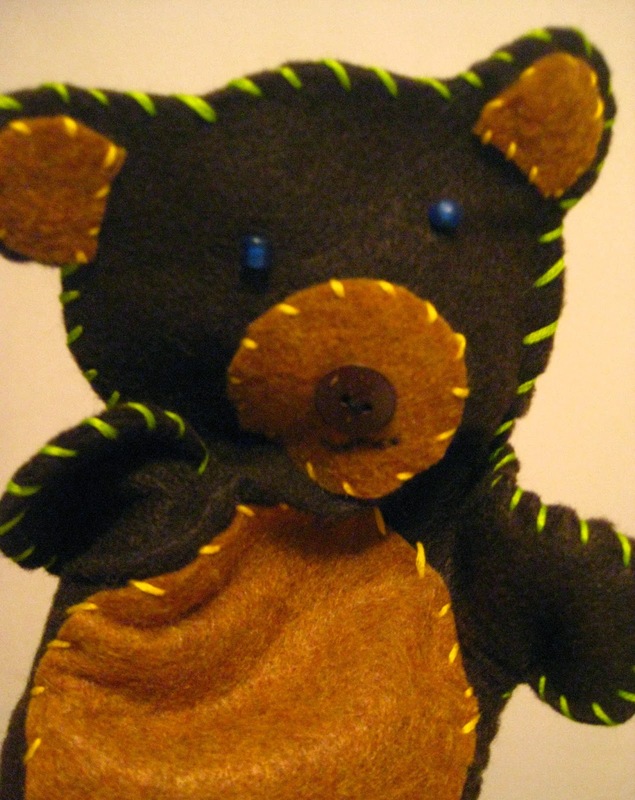 This little bear puppet asked, "Do you want to join us?" 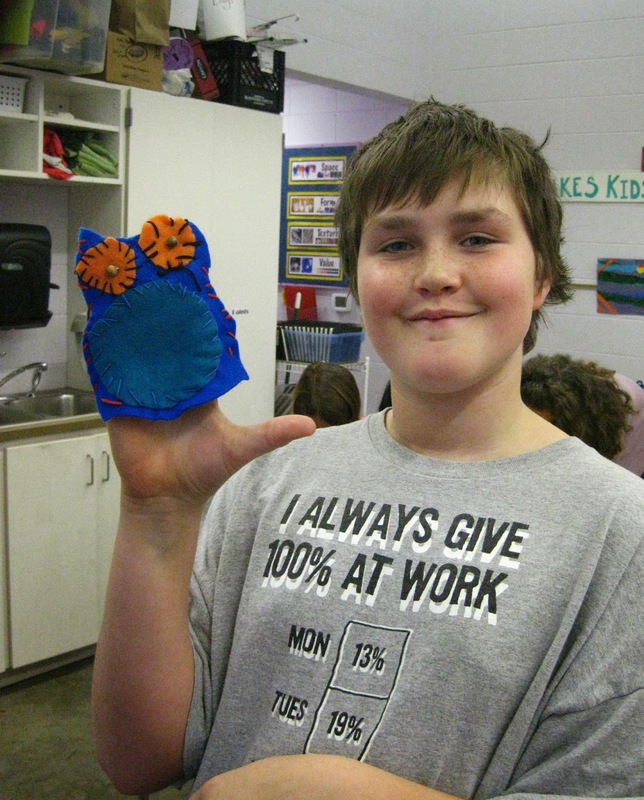 The children had the option to create a bear, bunny or owl puppet from patterns that I provided. 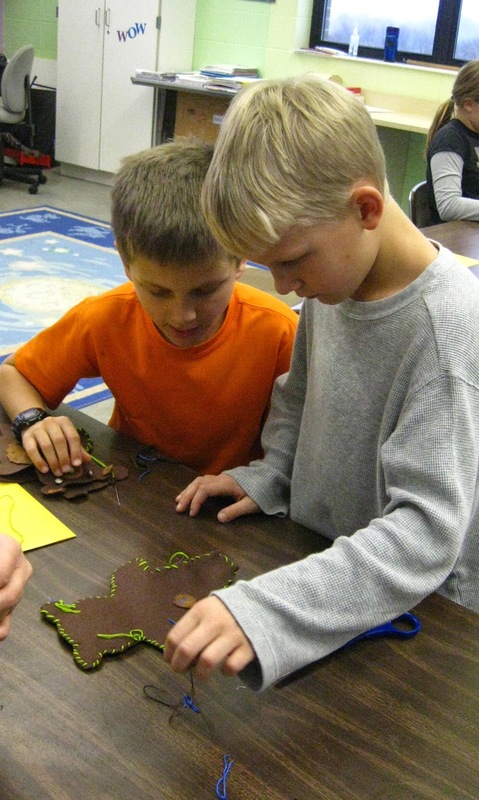 Or students could develop their own design. 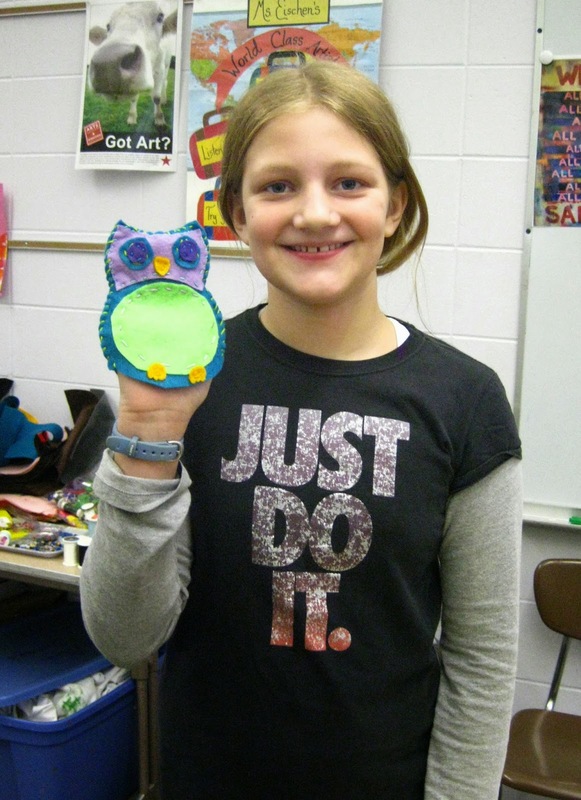 We used patterns from Lisa Griffith's, Woodland Puppets. 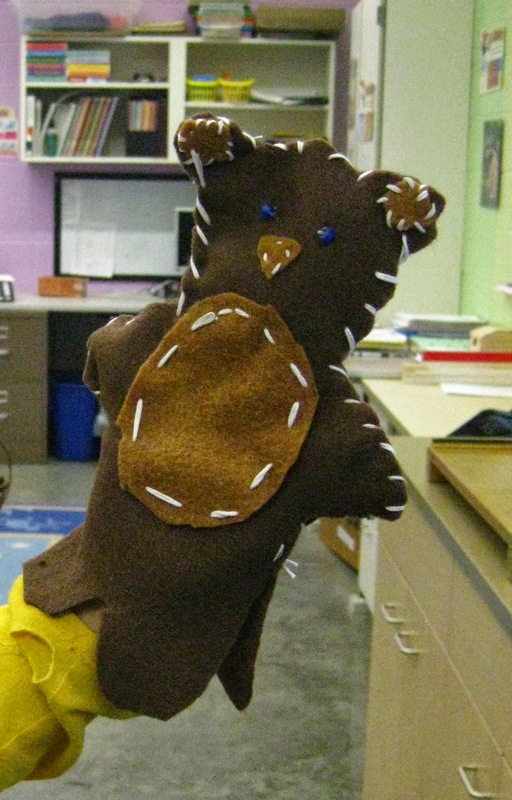 Fourteen students worked on bears, owls, or bunnies. 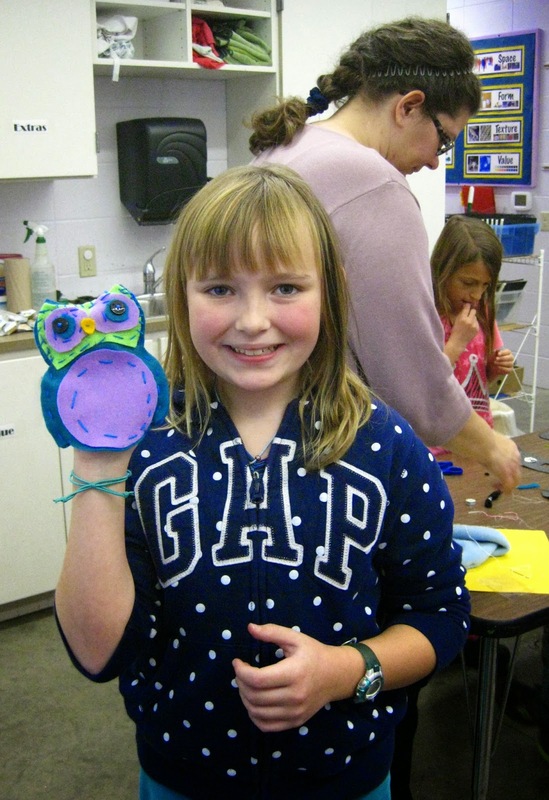 Three students created their own puppets. 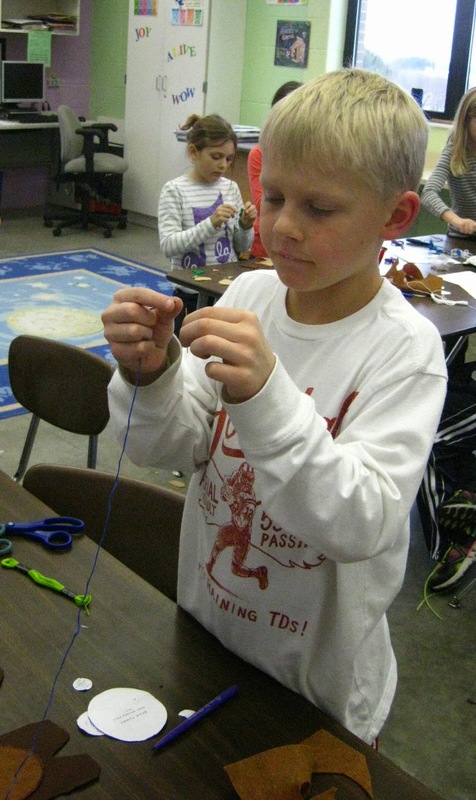 Some students had never sewn before, and we all learned to be patient with threading a needle, making knots, and creating stitches. 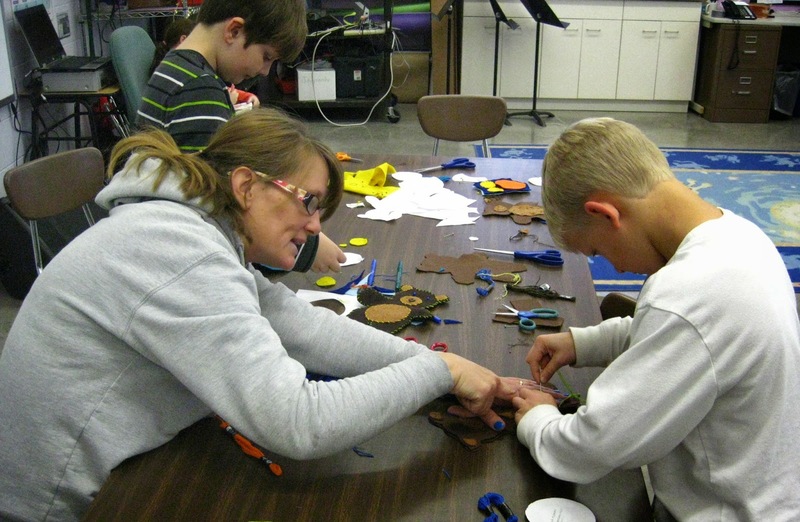 Two parent volunteers helped with the fun. 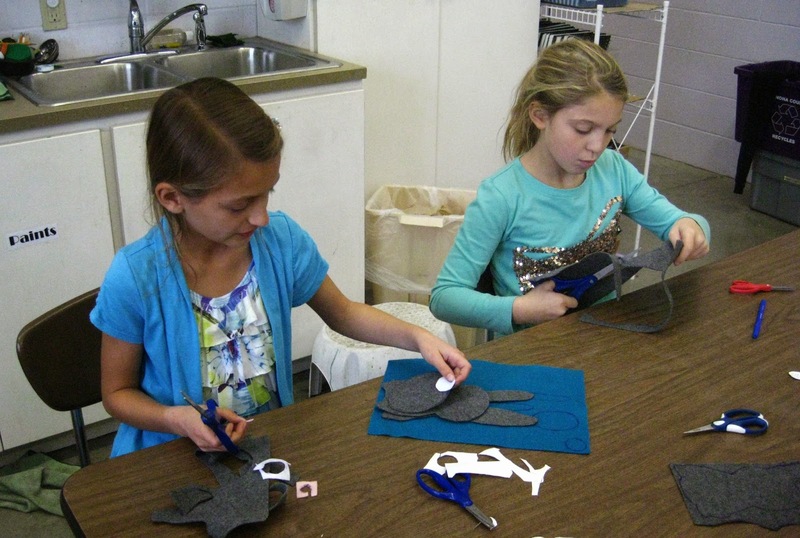 First, students cut out or created their patterns, laid them on the felt, and cut out the pieces. 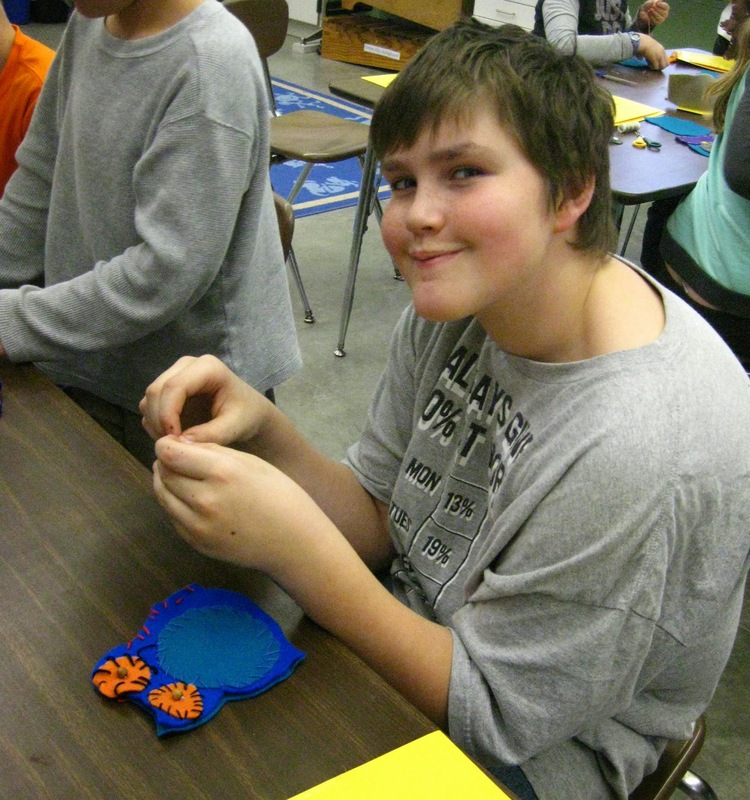 When the pieces were cut, students decided on what color of embroidery floss to use to stitch the parts together. We began the puppets in November; we had a week off for Thanksgiving and then came back to complete them the first week of December. Here are some of cool results. Some students stitched on buttons for eyes and others stitched felt. Lucas added a belly button to his bear. 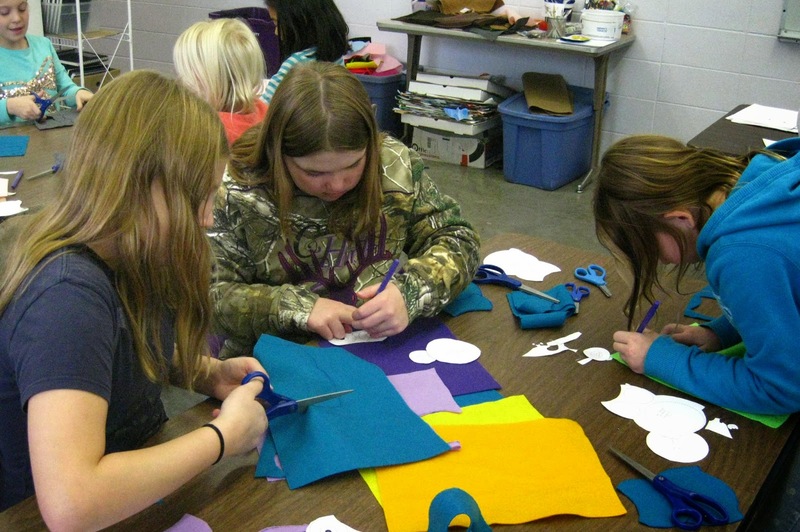 Students could use a running stitch that moved the thread in and out or a whipped stitch that brought the stitch over and around the two pieces. Either stitch worked well. 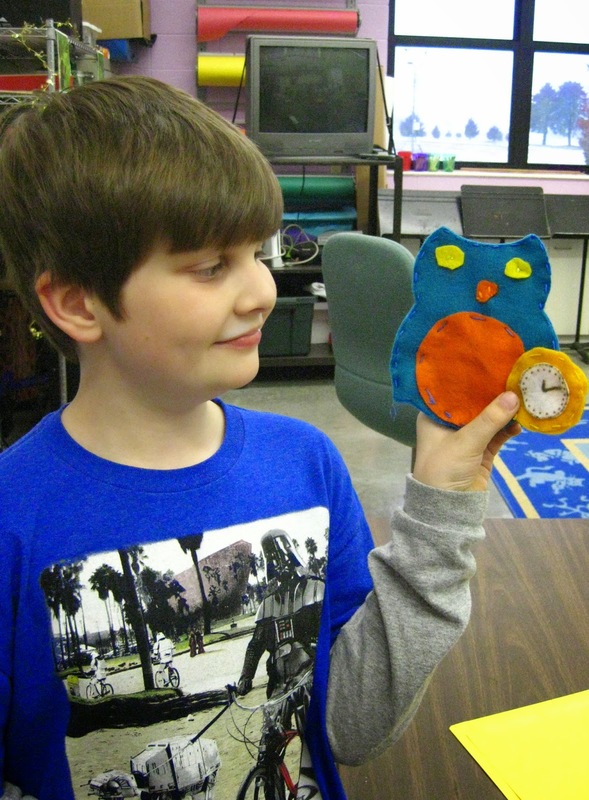 Jack created an owl and a watch. Happy and proud results from all of that stitching.